In my never ending quest to train myself mentally for the world of running just as much as physically, I have finished what I think is an amazing book. “My Life on the Run: The Wit, Wisdom, and Insights of a Road Racing Icon” by Bart Yasso. I cannot say enough good things about this book. Most of the running books I have read to date are training related. Books to get me to my next race. However this is not that kind of book. It is not a training book dedicated to get you that next PR (although more on that later). 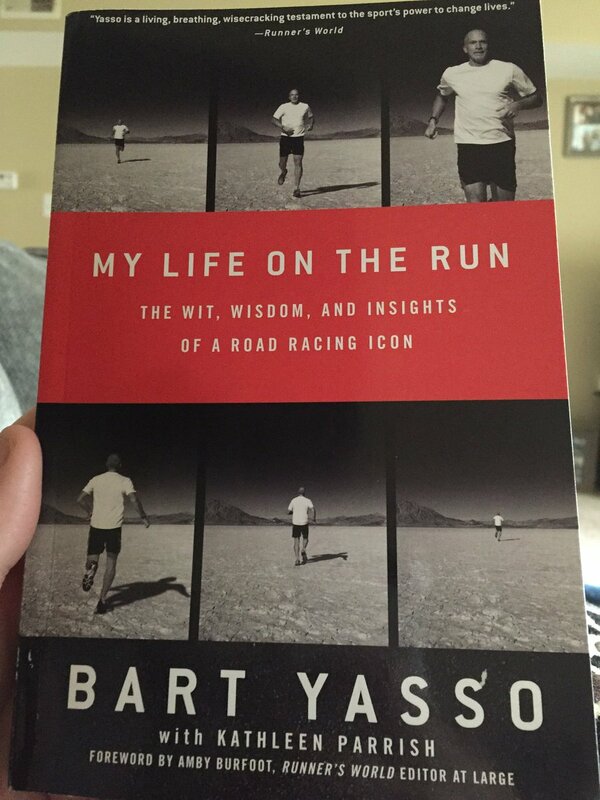 Instead this is a book about the life journey of running icon Bart Yasso. Most runners know who Bart is as he is extremely active in the world of running. However this book takes it to the next level because Bart has literally run some of the most ridiculous, exciting and historic races in the world. I recently finished reading Hal Higdon’s book: “Marathon: The Ultimate Training Guide”. I am not sure where to begin this review because overall I found it to be amazing. Hal is a very well trusted source in the running community, so I knew it was worth the purchase before even opening a page. My very first Half Marathon training plan was Hal’s Beginner Half Marathon program so I did have a little background knowledge on the author before starting the book. Overall he has beginner, intermediate and advanced training plans for Half Marathons and Full Marathons, so he knows what he is talking about. If I had to rate this book on a scale of 1-10, with a 10 being excellent I would happily give it a 10. The author really takes an in depth look at the marathon, from preparing yourself mentally before, during and after the race as well as preparing yourself physically. The second book on my marathon training adventure was “Marathon Training. The 100-Day Program for Success”. This book was written by Joe Henderson. I do not know the official background on Joe Henderson, but his words can be trusted. He mentions in the book that he was a contributor to Runners World magazine in the 1970’s. Also he talks about running marathons all over the country (including the major ones like Boston and NY). So as far as advice goes he is someone’s advice that I respect. Having said that, truth be told I did not finish this book. I got half way through before deciding to call it quits. Not because I thought it was a bad book. But it is truly a 100 day program for marathon training. Yes, I do realize that is in the title so this should not surprise me. But I took a chance on the book because I am new to marathon training and am not too good for anyone’s advice. With this years plan of running a full marathon I have started doing something I have never done with my running before. I have turned to books as a way to help me train. I have been told by others before that a full marathon is just as much mental as it is physical. [Really any run you consider major is mentally daunting regardless of the distance]. So to help offset any mental roadblocks I may face, I have ordered a few marathon training books. The first book I have completed is “You Can Go The Distance” by Bruce Van Horn. You can find it here. Overall I enjoyed the book. It wasn’t long, about 150 pages and physically a smaller book than your traditional paperback. The writing style I took from it was like that of one long blog broken up into many chapters. Bruce even writes in the beginning about how his facebook, twitter and blog followers were the inspiration behind writing it. How they read his work and suggest he write a book. And the book reads as such. Each chapter is a story of how his personal experiences lead him to how he thinks someone should train for a marathon. I am not sure of Bruce’s education background when it comes to running but he does reference coaching cross country. So overall Bruce comes from a point of view that can be trusted. His goal for his marathon was 3 hours and 30 minutes. For me, with a goal of 5 hours, I was happy to read about his personal experiences because he knows what he is talking about.